COLUMBIA -- He's the man in the middle for the Missouri men's basketball team, so how is Ricardo Ratliffe making shot after shot after shot this season? If the single most important goal in basketball is to put the ball in the basket, then Ricardo Ratliffe is having one of the most successful seasons in college basketball history. One of the first things you'll notice when you meet Ricardo Ratliffe is his bright white smile. "Actually I lived with him my junior year and that kid, he brushes his teeth like 10 times a day. After every meal. Everytime I came out of my room I would see him in the mirror brushing his teeth," senior center Steve Moore said. "Like everytime I'm about to step outside I brush my teeth and after every meal," Ratliffe said. "I think sometimes more. I say on average 5 or 6 times per day." Ratliffe says he takes care of his thousand watt smile because when he was younger he needed a lot of dental work. "So, ever since then I always told myself I was going to get the whitest smile I could have," Ratliffe said. Ratliffe gives Missouri fans plenty to smile about. He's shooting better than 70 percent this season, and is on pace to break the school record of 67.6 percent set by Jeff Warren in 1990-91. "I try not to think about it because I don't want it to start affecting my play cause I know if my play gets effected it's going to hurt the whole team," Ratliffe said. "I honestly haven't heard him say a word about it," Moore added. "You can just tell. You look at the way he carries himself on the court. He loves hooping." And the pick and roll loves him. It's a staple of Missouri's offense and puts the opponents defense in a no-win situation. "You have to pick your poison with the pick and roll. Either you guard Phil (Pressey) or you guard me, but Phil is so good at getting to the hole and creating for others," Ratliffe said. "I don't know, it just seems like every time we do it somebody scores." Ratliffe says he bonded with his teammates this summer when Navy Seals came to campus to teach teamwork. "It made me have more confidence in the guys. It made me trust them a lot more. Especially with the swimming pool thing because I didn't know how to swim. Having those guys hold me up, especially the smaller guys like Phil or Mike (Dixon) struggling to hold me up. It just made me trust those guys a lot more," Ratliffe said. 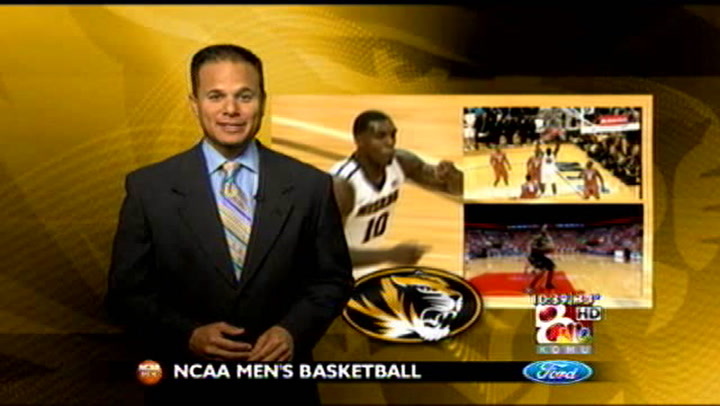 Now you can trust that Ratliffe is making a permanent mark in Mizzou basketball history. "I'll always be able to look into the Missouri media guides and see my name in there first for field goal percentage. It's just a confidence boost and something that I can always show my kids. Just put a smile on my face and put a smile on mine every time I look at it," Ratliffe said. The men's division one record for field goal percentage in a season is 74.6 percent, set by Oregon State's Steve Johnson in the 1980-81 season. Ratliffe is currently shooting 72.6 percent from the field.